The long lasting relation between the japanese sport manufacturer Mizuno and the IBAF has been extended to the 2012 season. Mizuno sponsorship will guarantee to the IBAF an amount of cash (that the 2 organizations didn't disclose) and the highest quality products from the professional lines (or VIK). Mizuno will also provide the official ball for IBAF competitions. Through the IBAF, Mizuno also reached an agreement to provide 300 dozens of balls to the top competitions organized in Europe by the Baseball Confederation (CEB). This marks another step towards ther ebranding of CEB into IBAF Europe. Mizuno was founded as Mizuno Brothers Limited, a shop in Osaka, in 1906 and began manufacturing baseballs and gloves in 1913. The name of the company was changed to Mizuno Co., Ltd in 1942. 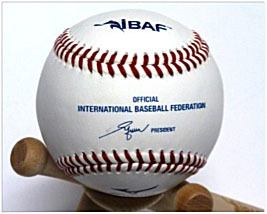 Since the late 1980s Mizuno has produced the official ball for IBAF competitions. Mizuno is showing financial and economical success. The 2011 Financial Year ended with a net income of 3.14 billion yen (over US $ 39 million). Mizuno corporate philosophy is made clear by this statement: "Contributing to society through the advancement of sporting goods and the promotion of sports". Recently the company announced that they will be removing "Mizuno" from the RunBird logo in all their baseball equipment. The Mizuno RunBird logo will continue to appear on their baseball clothing. Changes will be made to the domestic product line in September 2012 and to international pro equipment beginning in February 2013.